It seems like we’ve only just put away the Thanksgiving tablecloth and are already clearing room for the Christmas tree. Despite having been inundated with red and green and everything in between in the shops just after Halloween, it’s still hard to believe that we’re into the first week of Advent. Here at school, there are a number of harbingers of this holy season, during which we joyfully prepare our hearts for Jesus’s birth. First, students see the nativity scenes in the halls. Each day brings a new statue of a shepherd, or an animal into the barn, surrounding an empty manger. Also, the color purple becomes prominent on our bulletin boards and is the dominant color of the classroom prayer tables. Purple (or violet) is traditionally the primary color of Advent. While during Lent the color symbolizes repentance and fasting, during December, purple is the color of royalty, proclaiming Christ as king. Advent wreaths are another common site on campus. An evergreen wreath is used to symbolize eternal life and yesterday, on Sunday, the first candle of the Advent Wreath, the Candle of Hope, was lit. 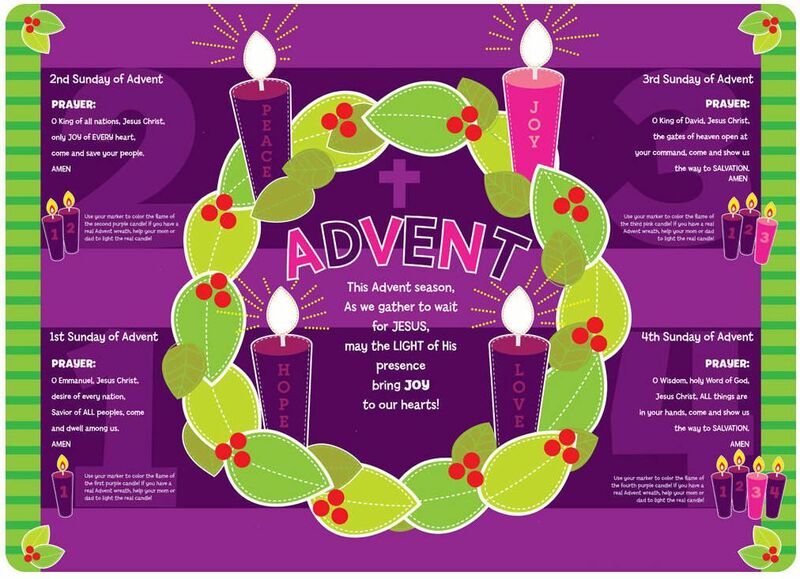 A purple candle is lit this week on the Advent Wreath (this link is one you can share with your kids). If you have an Advent Wreath at home, you may want to use this link as a resource for your family. It is a beautiful prayer that you can share which also serves as a respite from the hustle and bustle of the season. And much hustle and bustle there is! At school, we are not short on activities that keep our calendars full. The boy’s CYO basketball season begins. We are busily collecting gifts for our class Adopt-a-Family program. Christmas greens have been picked up and a number of swags and garlands are still available for sale. This Wednesday, Parent Club is meeting in the preschool building at 7 p.m. A number of classes continue to go on exciting field trips just as Progress Reports are being readied for distribution as latenext Monday. Laurel students will begin using the auditorium for their annual holiday show later this week into next week, and the 4th Grade is preparing for an all-school Mass this Friday at 1:45 p.m., to which you are warmly invited to attend. I am excited to celebrate this joyful season with all of you.